Continuing its contribution to the Cairo artistic and cultural scene, Al-Mawred Al-Thaqafy (Cultural Resource), a non-profit cultural organisation, carries on its mission to encourage the diversity and exchange between different talents in the Arab region. Additionally, the organisation has hosted several initiatives and programmes that support and develop artists regionally. This year, despite the political situation the country has been witnessing, Al-Mawred Al-Thaqafy hosted the Hayy Festival where concerts from five different countries were held at El Genaina Theatre, between 18 July and 2 August. Hayy Festival, has been going on for eight years, and in its debut years it hosted mostly Egyptian artists with a wide range of activities, from poetry readings, story-telling, Sufi and folk chanting, to circus and puppet shows. Later on, the focus of the festival turned into presenting female artists from diverse Arab and Mediterranean countries. The first editions of the festival did a magnificent job in hosting remarkable women performers from Algeria, Iraq, Syria and Tunisia, among Mediterranean countries, such as Spain. It didn’t take long for the festival to start garnering positive feedback from the audiences and critics alike. "Our main focus was to highlight female artists in the Arab world. At the beginning, we were testing this idea; however, it became the official theme of the Hayy festival. Each year, the festival tends to add something different, but most importantly we seek geographical variety when choosing vocalists and musicians from the Arab world," Charles Akl, the director of El-Genaina Theatre told Ahram Online. The choice of the artists for the 2013 edition was a success and appreciated from the audience. The voices and the talents varied from the sounds of Mauritania, through the Palestinian folk songs to Arabic and French pop, to classical Arabic music and rock beats. 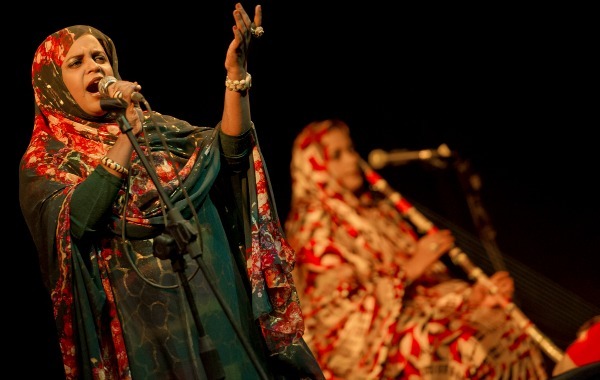 From Mauritania, singer Noura Mint Seymali opened this year's Hayy festival on 18 July, blending several musical genres. 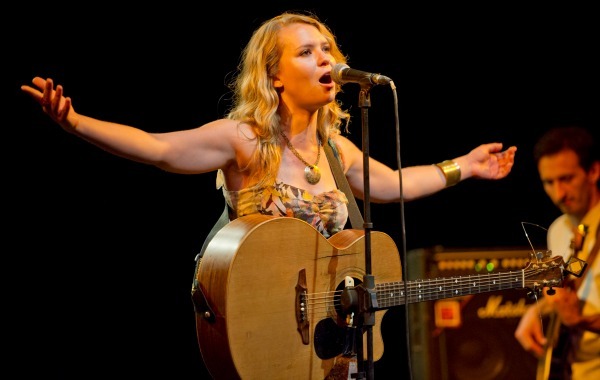 Her music carried distinctive elements from folk, reggae, blues, hip hop and zouk. Seymali engaged with the crowd and asked them to join her in front of the stage to dance. The audience's enjoyment was evident in cheerful crowds as they asked Seymali for several encores. Franco-Tunisian artist Nawel Ben Kraiem performed on 25 July, fusing electronic and Arabic music. Ben Kraiem kicked off the show with some pop-scented songs and then followed with electro-rock beats with a hint of Tunisian folklore. Inspired by real-life stories and socio-political issues, her tunes addressed topics like the revolution in Tunisia and the chaotic political scene the country is witnessing, immigration and the "Islamisation" of Tunisian society. 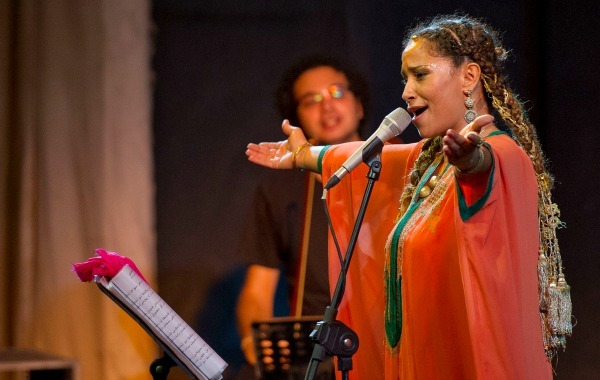 Another talent from the land of the Jasmine Revolution, artist Ghalia Ben Ali performed on 1 August, replacing the originally scheduled Iraqi singer Baidar Al-Basri. 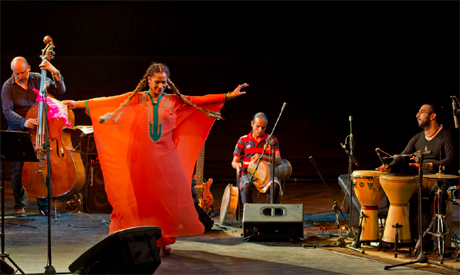 Ben Ali, with her considerable fan base in Egypt, energised the audience through her repertoire that mixed Arabic classical music with jazz and Indian tunes. Her classical Arabic tracks received a grand applause from the audience, who occupied every space in El Genaina Theater in a sold-out concert. Rock beats from the Moroccan Khansa Batma were signature of 2 August. Batma performed for the first time in Egypt. Known for combining the distinctive Moroccan accent with alternative rock, she did a fine job interacting with the audience, who enjoyed the experience that added Western melodies to her poignant and sensitive voice. She included songs from her latest albums like, Nestahel. From Palestine and already known in Cairo, Sanaa Moussa gave a folk- oriented performance as she explored the musical riches from the Palestinian heritage – which she is famous for. A Hayy festival veteran, Moussa brought a taste of contemporary folk tunes fusing them with classical Arab music. While Moussa strives to pass all those cultural gems to younger generations, she is also voicing the sound of Palestinian women who struggle to be heard under occupation. Akl commented on the fused line-up that brought different genres into one festival by saying "Al-Mawred's team is very experienced in knowing who the people would like to listen to. We have to remain very much updated with the new music that appears. We try to offer something artistically rich that receives acceptance from the audience." This year's festival was especially challenged by political situation in the country, resulting in some changes to the festival's line-up. "This year we operated under particularly difficult circumstances," Akl comments. "All the logistics of the festival were finalised prior to 30 June [day of nation-wide protests which eventually led to removal of Mohammed Morsi from presidency] and everything that followed that date was unexpected and we had to adapt to that. However cancelling the festival was not an option for us," Akl points to a series of protests and the difficult security situation in Cairo. Akl reveals that a number of artists couldn’t make it to the festival. "They [the artists] didn’t want to come to Egypt at this critical time. We originally had seven performers, but two artists cancelled because they were afraid, so we ended up with only five," Akl commented. Not only does Mawred emphasise the authenticity of the hosted performances and bands, but the theatre's location contributes to bringing together Egyptian and Arab heritages. In light of creating an authentic cultural environment, the theatre creates an intensive taste of the Egyptian culture as it is located along the Ayoubi Cairo Wall, which oversees Old Cairo. With the variety of performances that the Cultural Resource brings, attendance numbers can be very unpredictable, especially when attendees show up in large numbers – a fact that was particularity commendable keeping in mind this year's political challenges. For the Ghalia Ben Ali concert, four hours before it was to begin the Cultural Resource official Facebook page announced that it was sold out. Despite that, many people came to El-Genaina theatre hoping to buy a ticket from the booth only to discover there truly were no more spots. Two thousand showed up, in fact – an overwhelming surprise for the location that was designed to fit only 500 audience members. Commenting on this unprecedented number, Akl told Ahram Online that "El Genaina Theatre is the only venue for Al Mawred Al-Thaqafy’s concerts, so we are tied to hold our events here in El Genaina Theatre; however, I hope that we get a larger place for our events in the future." The Cultural Resource also offered Ticket Marché as a new way of purchasing tickets, beside the normal ticket sales at the booth in front of the theatre entrance. "We preferred to offer tickets online so that people guarantee that they have their place reserved before coming to El Genaina," Akl explained. Some complained of technical difficulties and a time consuming experience in using the Ticket Marché due to breakdowns in their system, although that was one of the Cultural Resource's efforts streamline ticket sales. Ticketing logistics can easily be addressed won't stop Culture Resource's dynamic and obviously successful festival. The festival did not bend under a series of challenges it had to face this year. It stuck to its mission and pulled off five remarkable evenings. It is also important to underscore that Hayy 2013 was one of the extremely rare artistic events who saw the light during this Ramadan – with many others being cancelled: El Sawy Culturewheel suspended all concerts for the holy month of Ramadan, Cairo Opera House cancelled its Ramadan programme and several other cancellations took place as the days were passing. With its remarkable dedication to the well-chosen artistic riches that the Arab and Mediterranean region offers, commitment to the festival's audience and strong organisational backbone, Hayy is no doubt one of the most remarkable artistic events taking place in Cairo.